* as the locals call Trondheim today, in protest against the forced Nordification of the Dano-Nordic name for the city, Trondhjem. Joe I've liked every bit of Norway that I've seen, but I have a particular fondness for the western coast. 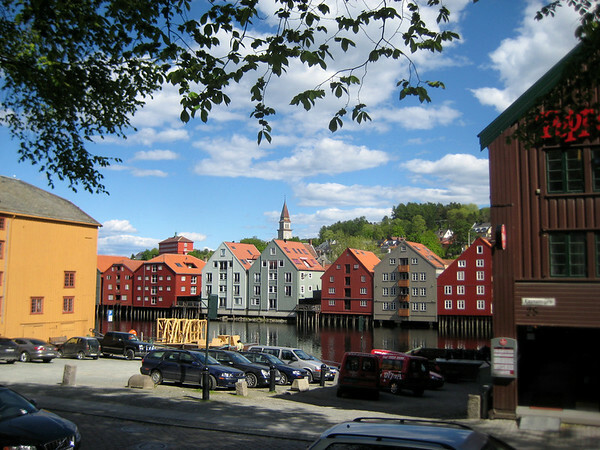 It's not just the beautiful scenery, it's also the towns and small cities, each a charming blend of carefully restored wooden buildings and crisp, modern Scandinavian designs. 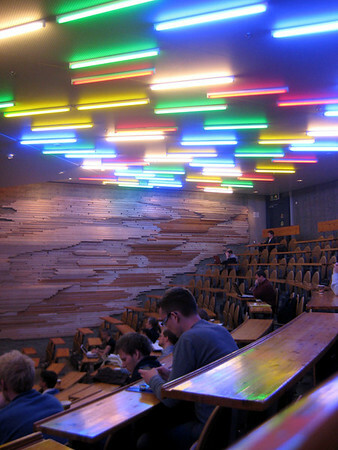 I suspect that the rustic part of that combination only survived because Norway was such a very poor country until they found oil; certainly the minimalist modern portion was made possible by the oodles of state-controlled oil money that have subsequently made it such a very rich country. 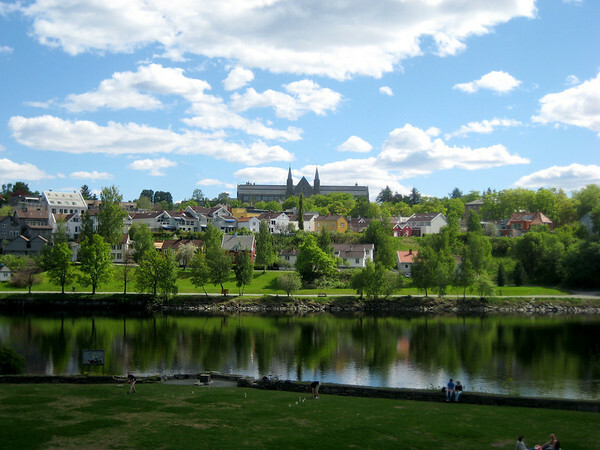 But whatever the cause, the effect makes for some very pleasant cities, and Trondheim is a prime example of the type. 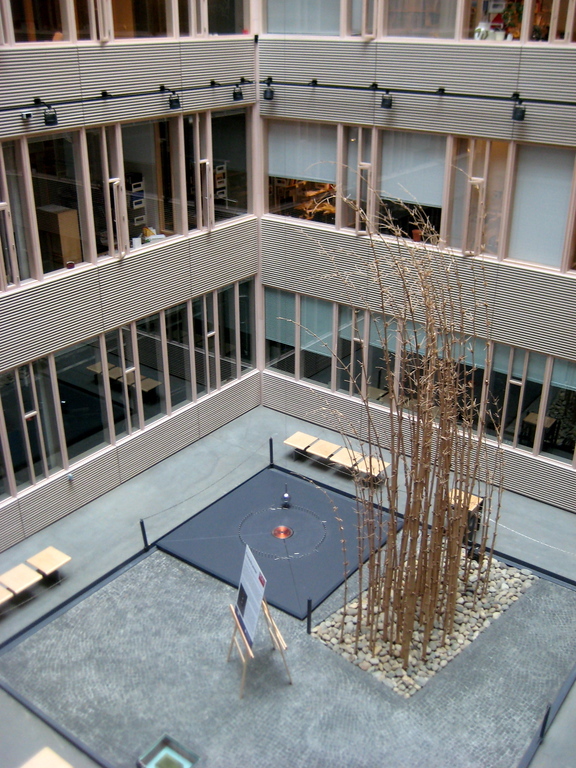 NTNU's Administration Building looms over a riverside park; in the foreground, NTNU students make a dismally unsuccessful attempt to play kubb. 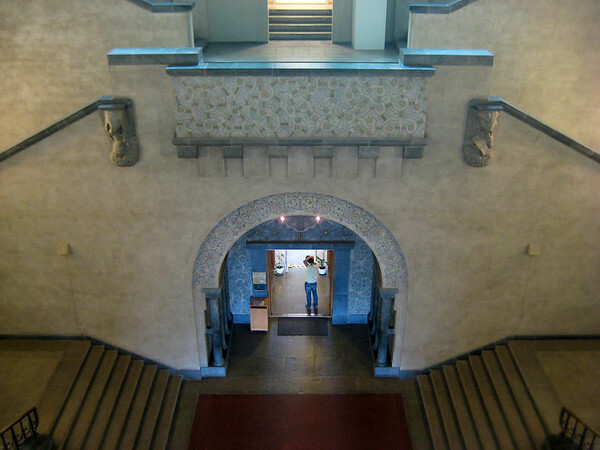 Interior from Hovedbygningen, showing jugendstil details. The lecture hall where SCAI2011 met, tucked in a seemingly obscure corner of the basement. 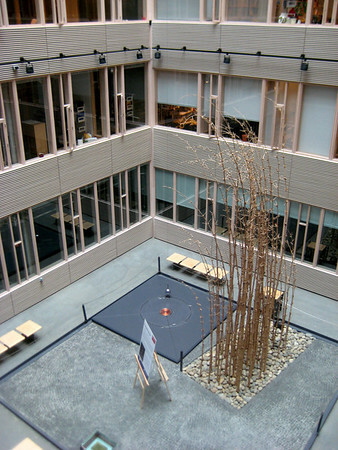 The offices were arranged around a series of 4 to 7 story enclosed courtyards, complete with giant bamboo. Þróndheimr was really the name of the district, not the city, which was usually called either Niðarrós or kaupangr í Þróndheimí. The latter was shortened by the Danish overlords to become Trondhjem. Interestingly, when Kristiania became Oslo during the Norwegian nationalist movement, the government tried to resurrect Nidaros as well, over the protest of the locals. Apparently there were riots. The government gave in the next year, but not without getting in two final jabs: they renamed the diocese Nidaros, and they changed the spelling of the city to Trondheim. 80 years later, the locals are still purposefully mispronouncing their city's name in a impressively prolonged bout of passive-aggressiveness. Funny story: walking home at about 1 in the morning from the microbrewery to which the conference dinner had earlier adjourned, I was accosted by a pair of obviously drunk, 20-something Norwegian youths, who offered (in Norwegian) to sell me a running shoe (just the one). When I declined, they wondered if I might just like to take the shoe, instead. When I declined again, my accent must have finally sunk in, because one of them got a puzzled look and asked, "Er du ikke Norsk?'' I admitted that I was not, and the less drunk of the pair immediately said, in surprisingly flawless English, "Oh. I am very sorry to have bothered you," before dragging his friend off down the block.